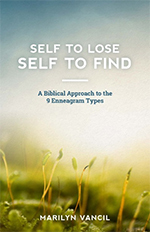 Set apart a few hours, a whole day, or an entire weekend to discover more about God, yourself and others, and how your Enneagram style affects all areas of your life. In many cases, I create my interactive workshops and retreats around the needs and knowledge of the individuals or groups attending. I would love to present one in your area! The “Now I Get Me!” workshop is designed for individuals to better understand themselves and how their Enneagram pattern both reflects God’s image and also keeps them from expressing and experiencing it more freely and fully. The “Now I Get You!” workshop is for couples, families, ministry teams, and other groups who want to gain a deeper understanding and connection with each other. “Lights go on” as people recognize how they view life through very different lenses and that their particular Enneagram style both enhances and creates challenges in their relationships. The “OWN-UP Retreat” is for a whole day or a whole weekend. OWN-UP is a reflective practice I developed to help people pause and pay attention to how their Enneagram pattern operates in their everyday circumstances. Participants will engage with this self-awareness practice, both in times of personal reflection and interactive conversations.